If it is too sticky, knead with a little flour until it is workable. 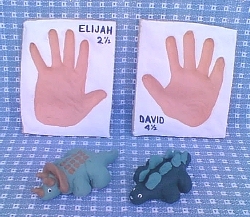 Make hand molds of kids or grand kids. Bake your creations at 350 degrees for 1 to 2 hours or until they are slightly browning and hard. Let Cool. Paint as desired and finish with Varnish or Sealer to give it a shine. For play as dough only, NOT for baked projects. We found this recipe in a children's activity brochure from a local School District; it has a WONDERFUL consistency for play! Put the water and the desired amount of food coloring in a medium saucepan. Cook and stir until dough forms a softball. Knead a bit before starting to create. Pound, Squish, and Mold Away!